Here’s a project I worked on during Matti Niinimäki’s Physical Interaction Design course. Wave-o-Matic a stand-alone MIDI controller device built by using a single Arduino Mega board and sensors. 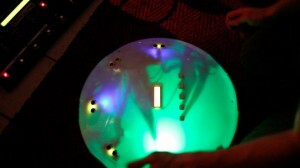 The device has five ultrasonic sensors detecting user hand movements and gestures. An ultrasonic sensor searches for objects within its reach, calculates the object distance from the sensor and transmits this data to the Arduino board. This data is converted to MIDI notes and control values (CC) and sent to the MIDI OUT port of the device. Detection field of an ultrasonic sensor is directed up towards the ceiling (in the default case that the device is standing and is not tilted). The range of the field is from few centimeters to 3 meters, but for more convenient use of the device the maximum range is limited to approximately one meter. Each ultrasonic sensor has two modes (MIDI note mode and MIDI control value mode) and the modes can be selected with a toggle button below the sensors. A bright LED light below the sensor means that it is in MIDI note mode. There is also a single LCD text display on the device that shows what note and value is being sent from the sensors. This mode allows user to play MIDI notes by moving an object (hand) in to the detection field of the ultrasonic sensor field. The pitch of the MIDI note varies by distance of your hand from the sensor. Lower distance results in a lower note being played and higher distance results in higher notes. The scale of the notes is natural by default but you can also set a mode (for example, raga or pentatonic minor) and play only notes that belong to that mode. You can also set a root key for the mode. This mode sets the sensors to send MIDI CC data values (0-127). The values depend on your hand distance from the sensor. When you remove your hand from the sensor detection field the last value is stored. It was played live for the first time at the TIFF party in Tromso, Norway in January.There’s a video coming soon from that performance. I’m developing the project further and next I’ll take it with me to SXSW in Austin, Texas. This entry was posted in Interactive Electronics and tagged arduino, midi, Tommi Koskinen. Bookmark the permalink.